Over the past few months the Young Farmers’ Clubs of Ulster with the support of Danske Bank have been on the road delivering land mobility road shows across Northern Ireland. These road shows have brought a number of business experts and agricultural figures together to discuss issues surrounding land mobility in Northern Ireland. This week the final in this series of land mobility road shows visited CAFRE, Loughry Campus, Cookstown. The event provided young farmers and farming families with the opportunity to hear from guest speaker Austin Finn, Macra Na Feirme’s Land Mobility Programme Manager. Austin has extensive financial and farming expertise alongside experience assisting many in planning for their futures; ensuring that the best options and advice are provided to all involved parties. At the event Mr Finn noted that over 400 successful matches have been created throughout the Republic of Ireland. He also delivered an engaging presentation providing attendees with a valuable insight into how the mechanics of the scheme have been successfully rolled out in the Republic of Ireland. 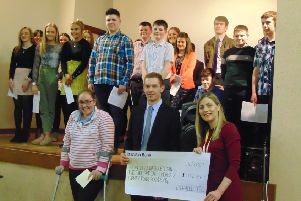 Each event in the series was chaired by the YFCU and UFU Land Mobility Manager, John McCallister. Commenting on the success of the road shows Mr McCallister said: “The YFCU road shows have provided a great medium to meet farmers of all ages who are interested in developing an understanding of land mobility and the many benefits that a scheme of this kind can bring. Following the final road show, YFCU deputy president, Zita Blair said: “As an industry, farming and agriculture in Northern Ireland is progressing positively. “I am delighted with the number of attendees who have come along to each of our land mobility road shows. “It demonstrates a real interest in land mobility, highlighting the prosperity that comes from relationships between established farmers and young farmers eagerly wishing to enter the industry. “I would also like to take this opportunity to extend our thanks to John McCallister for chairing each of the road shows. “Thanks also to each of the guest speakers: Michael Haverty, and Oliver Hall from Andersons Farm Business Consultants and Austin Finn, Macra Na Feirme’s Land Mobility Programme Manager.